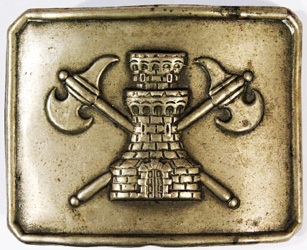 The basic design of the artillery belt plate was introduced by the R.O. of February 24, 1836. Initially, a flaming bomb appeared above the crossed cannon. A pyramid of 6 or 10 cannon balls was placed below. 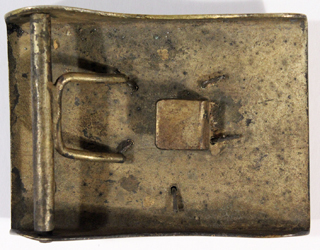 The brass plate measured approximately 7.62 x 5.08 cm. By 1843, a royal crown replaced the flaming bomb in the design. 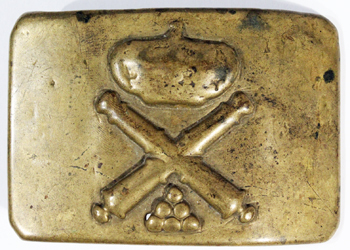 This pattern belt plate with an embossed crown over crossed cannon and a pyramid of cannon balls remained basically unchanged until 1931. The plate exists in a number of variations. Only provenance and the method of attachment on the the reverse can distinguish 19th century examples from 20th century plates. 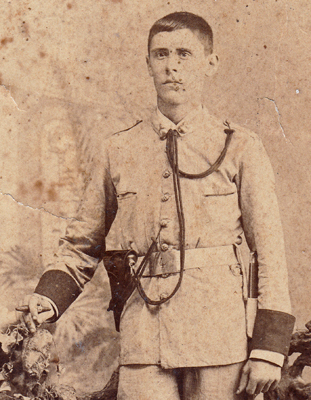 An 1860s CDV of a well equipped Peninsular artilleryman wearing the standard Model 1843 plate. 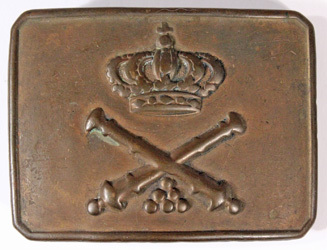 A typical Model 1843 artillery belt plate displaying the elements of crown, cannon and cannon ball pyramid. This example measures 8.5 x 6.5 cm. Variations in size and details are common. Variant matching the size of the 1867 infantry plate. The dimensions are 8 cm long and 5.5 cm tall. 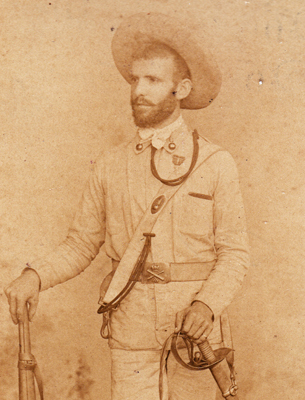 An image of a mounted artilleryman, probably a member of the Brigada Mixta de Artillería which contained the only two mounted batteries in Cuba, taken about 1897 shows he wearing one of the many variations of the Model 1843 plate. A variation with a raised border measuring 7.9 x 5.8 cm. This is possibly a Cuban locally made specimen. There is a period label on the reverse inscribed "CUBA, 1898." The R.O. of March 28, 1869 continued the use of the Model 1843 plate for some units. Other units began using plates pierced with the regimental number. It is a little unclear which regiments wore these pierced plates in place of the 1843 plates. However, by the 1890s, photos of enlisted men of all regiments can be found wearing 1869 pattern plates. 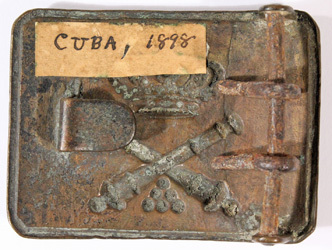 The size of souvenir examples from Cuba measure about 7.8 x 6 cm. 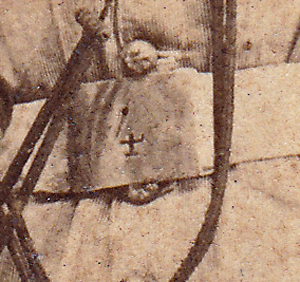 A soldier serving in Regimiento de Artillería de Montaña No. 4. 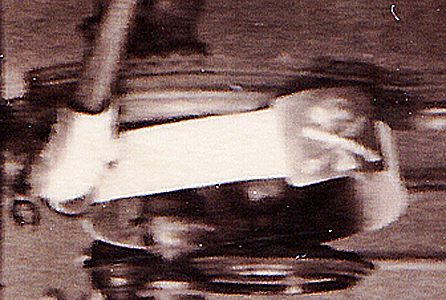 The image detail shows his 1869 belt plate with the pierced unit number. An 1869 pattern plate taken as a souvenir at Santiago de Cuba in 1898. The second section, first battery of the Regimiento Artilleria de Montaña No. 5 was part of General Escario's relief column out of Manzanillo that fought its way into Santiago just before the city surrendered. The Batallon de Artilleria de Plaza No. 12 defended Puerto Rico until 1898. The artillery plates with Puerto Rican provenance observed in both photographs and as souvenirs are all of the 1843 model. It is possible that 1869 pattern plates pierced with the number "12" exist, but none have yet come to light. Most of the artillery belt plates that have come down to us in the souvenir record are the Model 1843 plates use throughout the empire. 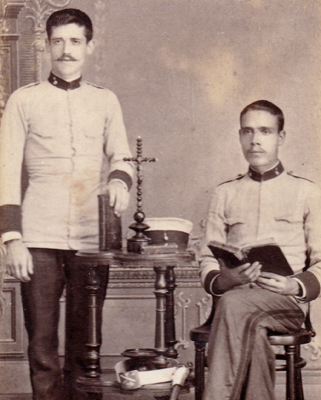 Two details of an 1890s CDV of two artillerymen taken in Manila. 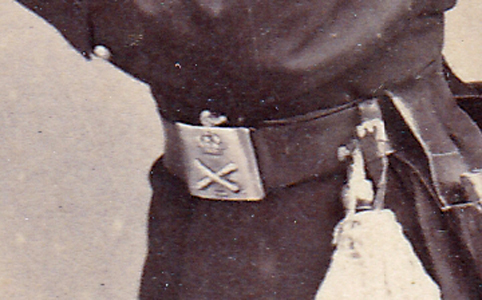 Shown is the Model 1843 artillery belt plate on the regulation white buff leather belt. 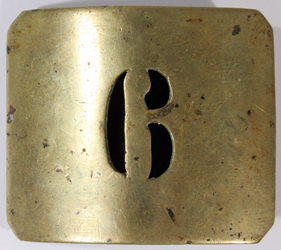 Several examples of the 1869 pattern pierced number plates, worn by troops in the Regimiento de Artillería de Montaña No. 6, with the unit number have been observed that have solid Philippine provenance. While these match the regulations in size, they appear to be locally made. 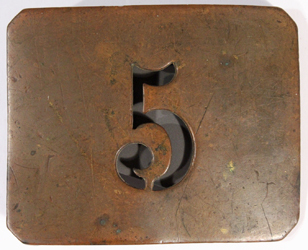 Casting is a bit crude and the catch and loop on the reverse are on the opposite sides of most other plates, making one think that they should read as the number "9." This example of the Philippine made 1869 pattern was the souvenir of a soldier in the 13th Minnesota Infantry. Other known examples have connections with souvenir groups from Michigan and Nebraska. Like the plain plate discussed in the infantry section, this plate resembles the German Model 1895 belt plate. This is the only known example and was among the souvenirs brought back by an American soldier from the Philippines. 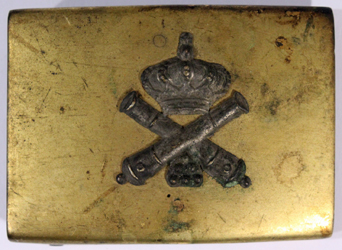 Made of nickel with a plain face with an applied brass artillery emblem. Like the similar infantry plates, very little is known about these plates other than that they are Spanish and are found only in the context of the Philippine souvenir record. No regulation for this pattern has been found and exactly where they were manufactured is not known. I welcome additional documentation and photos of other examples of this plate. 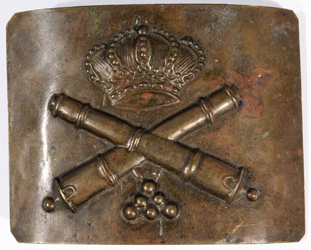 The only known example of an artillery German style plate. It was found among other Spanish souvenirs brought from the Philippines in 1898-99. The Uniform Regulations of 1862 and after. 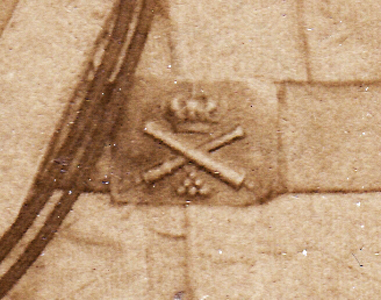 The 1862 pattern engineer belt plate remained unchanged throughout the colonial period. The trophy of a castle tower over crossed axes is embossed in bold relief on a nickel or similar white metal plate. The same plate appears to have been used in all of the colonies as there are no known local variations. This basic pattern continued to be used until 1931. Only provenance and the method of attachment on the the reverse can distinguish 19th century examples from 20th century plates. 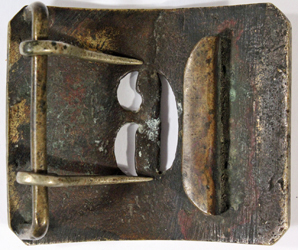 This Engineer's belt plate was brought to the United States by an unidentified American soldier from Cuba after 1898. As a souvenir of the Spanish American War it is unquestionably of 19th century manufacture. All material is Copyright 2017 by William K. Combs. No portion may be used without permission.